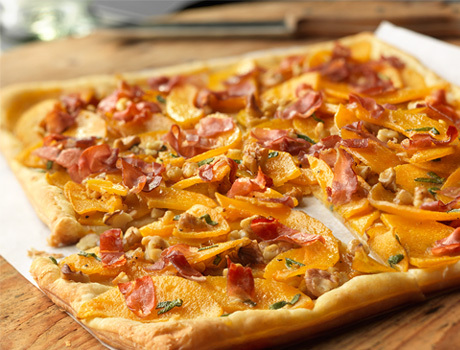 This delightfully different flatbread recipe features light and airy puff pastry topped with a scrumptious squash mixture thats finished with prosciutto slices. Its a mouthwatering treat that cant be beat! Heat the butter in a 12-inch skillet over medium-high heat. Add the squash and cook for 6 minutes or until tender, stirring occasionally. Add the walnuts and sage and cook and stir for 1 minute. Season with salt and black pepper. Unfold the pastry sheet on a baking sheet and roll into a 9x12-inch rectangle. Prick the pastry sheet thoroughly with a fork. 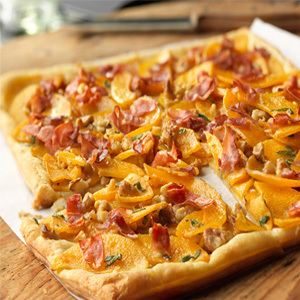 Spread the squash mixture on the pastry sheet to within 1/2-inch of the edge. Sprinkle with the prosciutto.